It is not unusual for a child at Positive Tomorrows to have some experience with the criminal justice system. Homeless families are more likely to experience domestic violence, addiction, or to have a parent who is incarcerated. For students at Positive Tomorrows, uncertainty and anxiety often stem from upcoming court dates and navigating the legal system. This semester, students at Oklahoma City University School of Law (OCU Law) worked with Judge Don Andrews to familiarize students at Positive Tomorrows with the legal process in a fear-free and fun way. OCU Law students visited the 4th and 5th grade classroom for two afternoons to prepare students to participate in a mock trial, where they would try Gold E. Locks for destruction of property at the home of the Bear family. The day of the mock trial, students traveled to the Oklahoma County Courthouse and set up in Judge Andrews’ courtroom. Working from a script, each child had a special role to play including attorneys, the defendant, witnesses, and of course the judge. Students may have giggled their way through lines about too-small chairs and cold porridge, but they were truly immersed in the experience. 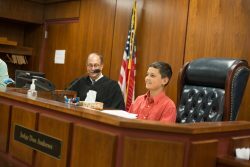 At the end of trial, the student Judge, Jayden, visited with Judge Andrews in his chambers to reach a verdict. Gold E. Locks was found guilty, and sentenced to probation. After 30 days of good behavior, and replacing Baby Bear’s chair, her record would be wiped clean. Judge Andrews was so generous in giving students time in his chambers and spent time answering questions about the courtroom after the trial. He even let each student have a seat in his judge’s chair. This experience not only eased the fears about the courtroom for our students, but also introduced them to careers in the legal field. 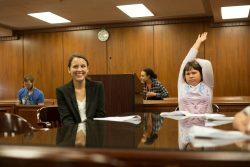 Kids stepped into the shoes of judges and attorneys in a way that was fun and educational. Positive Tomorrows is so grateful for the volunteers from OCU Law and Judge Andrews for their generosity in making this special day possible for students. Interested in volunteering with the students at Positive Tomorrow? Learn more today! An OCU Law volunteer works with student, Mikayla, who played Gold E. Locks. Student Judge Jayden presides over the mock trial, while Judge Andrews looks on. 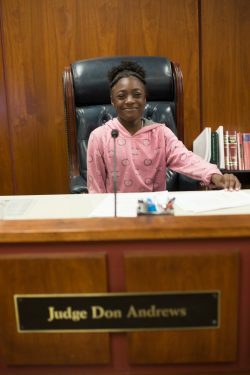 Ariyah sits in Judge Andrew’s chair. 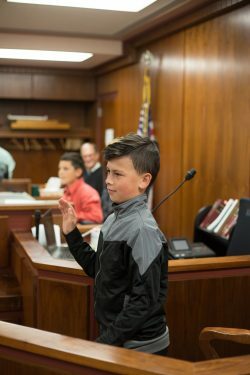 Positive Tomorrows student, Brandon, is sworn in before playing a witness in the mock trial.